I'm kind of new to blender, I've been using it for about two weeks but haven't used sculpt mode much. Today I decided to sculpt the head of a character, using a multiresolution modifier to help get the geometry I wanted, but I can't apply the multiresolution while in sculpt mode and if I leave sculpt mode my object turns back into a low-poly model. 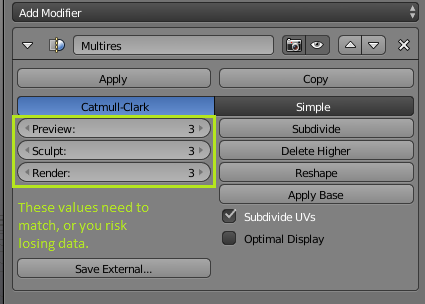 If I apply the multiresolution in object mode then all of my sculpting is gone for good. How in the world do I keep my sculpting work while in something like edit or object mode? You need to raise the Preview value to match the Sculpt value before applying the modifier. Not the answer you're looking for? Browse other questions tagged modifiers sculpting or ask your own question. multi resolution needed in order to sculpt?